The harsh winter weather and fluctuating temperatures can cause a lot of stress on your roof. The constant thawing and refreezing shift we see in the Midwest can cause common roofing issues to occur quite frequently. If these problems are not addressed in a timely manner, they can quickly lead to costly repairs. Read on to learn more about these common winter damage issues and how you can prevent them from happening in the future. One issue you can experience during the winter months is leaks that derive from your roof’s flashing. The rooftop flashing is the long, strips of metal that can be found on the front edge, sides and corners of your skylights and/or chimney. Winter storms bring strong winds and flashing can be pulled out of place, allowing moisture to find its way into your home. It’s important to inspect your roof’s flashing at least once a year to ensure that it was installed correctly and did not become damaged during the previous year. Ice dams form when heat from the attic of your home escapes and melts the snow on your roof. This water collects in or around the gutters and can freeze to create an ice dam. It’s important to keep an eye on your roof during the winter months because ice dams can cause significant damage due to the extra weight they put on your roof and gutters. If an ice dam gets big enough, melted water can back up into the shingles causing interior leaks. To help avoid ice dams from forming on your roof, investing in a roof rake is an inexpensive way to assist in the effort. 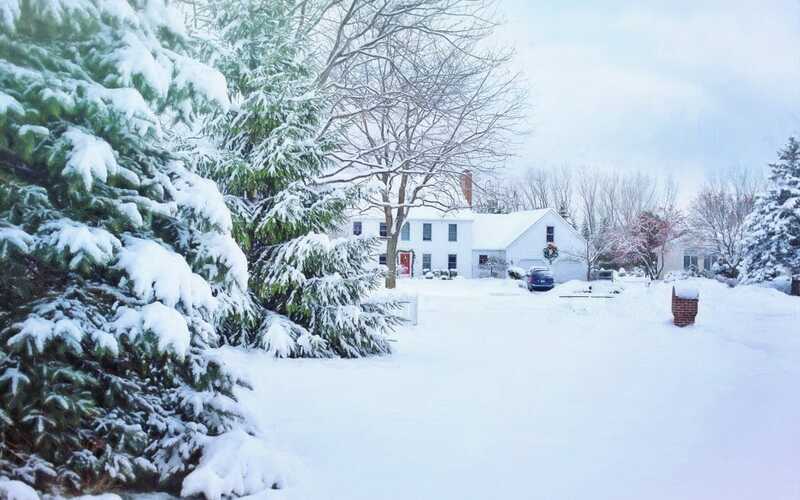 Even though there is not one way to completely eliminate the possibility of ice dams from forming, ensuring your home has proper insulation and a good attic ventilation system will greatly help minimize the risk. Condensation may not seem like a winter time issue, but it happens easier than you may think. When warm air finds a cold surface, condensation will take place. An improperly insulated attic during the winter months can be the perfect host for condensation to occur. If condensation occurs on your roof, mold and mildew can quickly set in on the shingles and decking. The formation of mold can quickly damage not only the structural integrity of your home, but also the overall aesthetic. In order to prevent condensation from occurring, much like ice dams, it’s important to ensure that your attic is being properly ventilated and insulated. Speaking of ice, icicle formation is another issue that can occur during the winter months. Even though they are pretty to look at, they can cause damage to your roof and pose a danger to people and pets that come in and out of the house. Icicles are typically the result of clogged gutters and/or downspouts. The extra weight they add to your roof and gutter system can result in shingles being pulled from the roof and gutters collapsing under the weight. One of the best ways to avoid icicle formation is to ensure that your gutters are clean before the winter weather hits. Keeping your gutters and downspouts free of debris has many benefits, including directing water away from the foundation of your home. If you have concerns about your ventilation system or gutters, give our team at Exterior Remodel and Design a call today! Our contractors can examine your home, write-up an estimate, and even walk you through the insurance process to help ensure that you get all of the repair and replacement costs covered. Contact our team today!